Summary: This was another frustrating RNS from the specialist currency manager. The cost base has ‘inevitably’ increased, yet revenue and client numbers remain stagnant and — as usual — there’s no real sign of the business enjoying an upturn anytime soon. At least REC continues to generate cash, retains a robust cash pile and distributes a healthy dividend. The yield is 5%, which is not too bad in the current market. I continue to hold. REC’s quarterly updates (Q1 and Q2) had already indicated these results would be a somewhat humdrum affair. The updates had informed investors that effective client assets under management (AUMe) had bobbed around the $60bn/£46bn mark for six months, which left my sums predicting annual revenue running at £24m… and therefore half-year revenue at the actual £12m. REC said first-half revenue and operating profit had gained 14% and 6% respectively on the comparable period of the year before. However, that comparable period enjoyed only three months of a post-Brexit GBP, which has since boosted REC’s finances as the group’s revenue is predominantly paid in the now stronger USD. Here we see the latest H1 showing revenue down 5% and operating profit down 11% when compared to H2. It appears the growing cost base I mentioned when I studied June’s annual statement has started to emerge (see below). REC’s typically long-winded narrative yielded very little on the prospect of the group winning new clients. The number of customers stayed at 59 during the six months and has increased by a net four since March 2015. REC’s ten largest clients produced 76% of revenue during the half, and this client concentration — alongside the lack of fresh mandates and the growing cost base — remains very frustrating. My £13m overhead guess appears to have been confirmed. Personnel costs of £4m plus non-personnel costs of £2.5m (i.e. the stated £2.7m less the £0.2m tender-offer costs) give £6.5m for the half-year and £13m for a full year. I just wish REC could inevitably expand its customer base and revenue to cover these inevitable extra charges. The differences may look small when compared to REC’s own figures, but they can create a sizeable effect on REC’s possible earnings. At least the strategies are showing positive returns since their respective inceptions. But whether the size of those long-term returns — at less than 3% — can encourage new clients to sign up is another matter entirely. REC’s cash flow was impressive once again. Little in the way of capital expenditure and working-capital movements meant the £3.7m operating profit was translated fully into cash and supported the payment of last year’s £2m special dividend. REC’s total cash position dropped by almost £11m to £26.3m following the £10m tender offer during July. 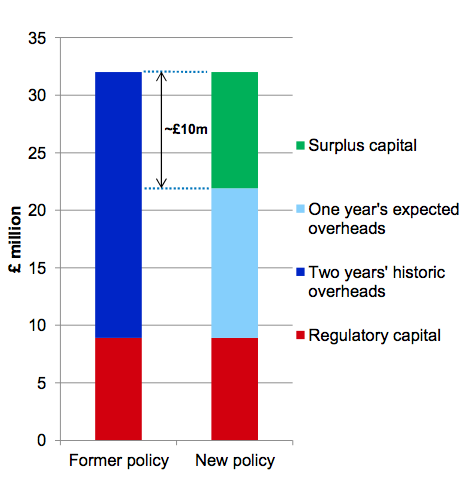 Factor in regulatory capital of £8.9m and third-party investments of £4.8m, and I reckon ‘surplus’ cash could be £12.6m or 6.4p per share. The balance sheet continues to carry no debt and no pension obligations. REC announced an H1 dividend of 1.15p per share, up 39% on the 0.825p per share declared for H1 last year. However, July’s £10m tender offer reduced the share count by 9% and on a total cash-paid basis, the H1 payout advanced from £1.8m to £2.3m or 28%. As such, the 2018 full-year dividend could be £4.6m — just 5% ahead of the £4.4m paid as ordinary dividends for 2017. After standard 19% tax, my new sums suggest earnings could be £6.0m or 3.03p per share. The P/E at 46p could therefore be about 15. Adjust for the ‘surplus’ cash and the rating drops to about 13. The highlight of this stock remains the yield, which is 5% using the anticipated 2.3p per share ordinary dividend. This entry was posted in My Shares, Record and tagged REC, Record on November 20, 2017 by Maynard Paton. This update extended the run of quarterly statements that did not reveal any significant progress. Total effective client assets under management (AUMe) advanced by $2.7bn to $63.9bn during the 3 months to 31 December 2017, and in sterling terms gained £1.7bn to £47.3bn. To put the “growth” of “new business” into perspective, client numbers increased by one to 60 during the quarter. The additional AUMe was almost entirely Passive Hedging money, which is REC’s lowest margin earner. Still, at least this Q3 statement did not own up to mandate losses. The last two quarterly updates had seen notable withdrawals. Just when ‘engaging with clients’ will actually translate into decisively adding new clients with sizeable high-margin mandates remains anyone’s guess at present. 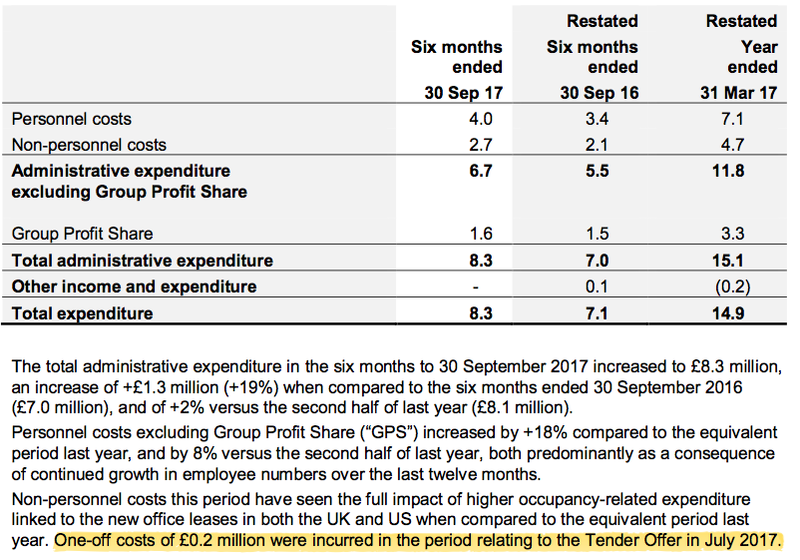 Less my guesses of £8,000k for staff costs and £5,000k for other costs as noted in the Blog post above, then less the 30% profit share (of £3,060k), I arrive at an operating profit of £7,139k. Taxed at 19% gives earnings of £5,783k or 2.91p per share. Three months ago I was predicting earnings of 3.24p per share. The 10% earnings guess reduction is due to the stronger GBP and the extra costs the intervening H1 results revealed (see the Blog post above). With the share price at 43p, my P/E comes to 14.8. REC’s ‘surplus’ net cash position — i.e. cash excluding regulatory capital and third-party investments — is close to £13m or 6.4p per share. My P/E adjusted for this ‘surplus’ cash is 12.6. 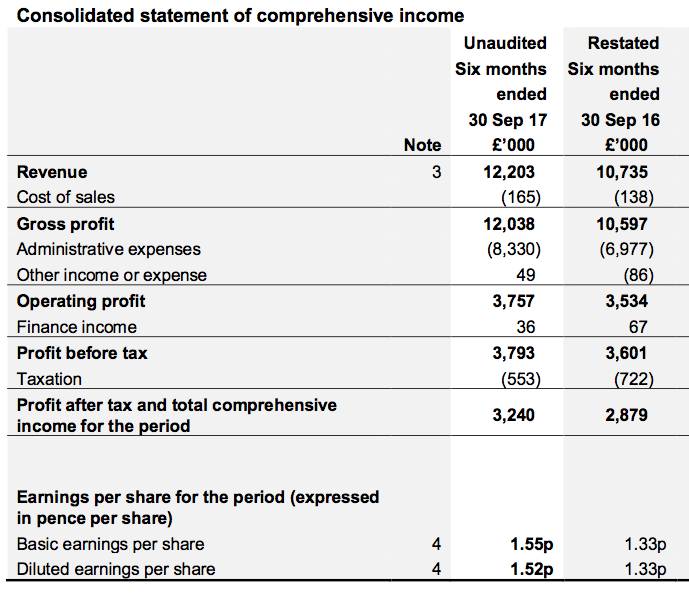 At least my 2.91p per share guess covers REC’s indicative 2.3p per share ordinary dividend, which supports a 5.3% income at 43p. So with my 2.91p per share earnings prediction exceeding REC’s indicative 2.3p per share dividend, there is some hope that a special dividend will be forthcoming.